AP-1 transcription factor has been shown to be involved in skin physiology, specifically in tissue regeneration. The process of skin metabolism is initiated by signals that trigger undifferentiated proliferative cells to undergo cell differentiation. Therefore, activity of AP-1 subunits in response to extracellular signals may be modified under conditions where the balance of keratinocyte proliferation and differentiation has to be rapidly and temporally altered. The AP-1 transcription factor also has been shown to be involved in breast cancer cell growth through multiple mechanisms, including regulation of cyclin D1, E2F factors and their target genes. c-Jun, which is one of the AP-1 sub units, regulates the growth of breast cancer cells. Activated c-Jun is predominantly expressed at the invasive front in breast cancer and is associated with proliferation of breast cells. ↑ Hess, J; Angel, P; Schorpp-Kistner, M (1 December 2004). "AP-1 subunits: quarrel and harmony among siblings.". Journal of Cell Science. 117 (Pt 25): 5965–73. doi:10.1242/jcs.01589. PMID 15564374. 1 2 3 4 5 Ameyar, M; Wisniewska, M; Weitzman, JB (August 2003). "A role for AP-1 in apoptosis: the case for and against.". Biochimie. 85 (8): 747–52. doi:10.1016/j.biochi.2003.09.006. PMID 14585541. ↑ Lee, W; Haslinger, A; Karin, M; Tjian, R (January 1987). "Activation of transcription by two factors that bind promoter and enhancer sequences of the human metallothionein gene and SV40.". Nature. 325 (6102): 368–72. doi:10.1038/325368a0. PMID 3027570. ↑ Angel, P; Imagawa, M; Chiu, R; Stein, B; Imbra, RJ; Rahmsdorf, HJ; Jonat, C; Herrlich, P; Karin, M (19 June 1987). "Phorbol ester-inducible genes contain a common cis element recognized by a TPA-modulated trans-acting factor.". Cell. 49 (6): 729–39. doi:10.1016/0092-8674(87)90611-8. PMID 3034432. ↑ Wagner, EF (30 April 2001). "AP-1--Introductory remarks.". Oncogene. 20 (19): 2334–5. doi:10.1038/sj.onc.1204416. PMID 11402330. ↑ Landschulz, WH; Johnson, PF; McKnight, SL (24 June 1988). 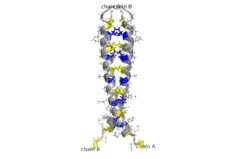 "The leucine zipper: a hypothetical structure common to a new class of DNA binding proteins.". Science. 240 (4860): 1759–64. doi:10.1126/science.3289117. PMID 3289117. ↑ O'Shea, EK; Rutkowski, R; Kim, PS (27 January 1989). "Evidence that the leucine zipper is a coiled coil.". Science. 243 (4890): 538–42. doi:10.1126/science.2911757. PMID 2911757. ↑ O'Shea, EK; Rutkowski, R; Stafford WF, 3rd; Kim, PS (11 August 1989). "Preferential heterodimer formation by isolated leucine zippers from fos and jun.". Science. 245 (4918): 646–8. doi:10.1126/science.2503872. PMID 2503872. ↑ Vogt, PK; Bos, TJ (1990). "jun: oncogene and transcription factor.". Advances in cancer research. 55: 1–35. PMID 2166997. 1 2 3 4 Angel, Peter; Karin, Michael (December 1991). "The role of Jun, Fos and the AP-1 complex in cell-proliferation and transformation". Biochimica et Biophysica Acta (BBA) - Reviews on Cancer. 1072 (2-3): 129–157. doi:10.1016/0304-419X(91)90011-9. ↑ Kouzarides, T; Ziff, E (15 December 1988). "The role of the leucine zipper in the fos-jun interaction.". Nature. 336 (6200): 646–51. doi:10.1038/336646a0. PMID 2974122. ↑ Nakabeppu, Yusaku; Ryder, Kevin; Nathans, Daniel (December 1988). "DNA binding activities of three murine Jun proteins: Stimulation by Fos". Cell. 55 (5): 907–915. doi:10.1016/0092-8674(88)90146-8. ↑ Karin, Michael; Liu, Zheng-gang; Zandi, Ebrahim (April 1997). "AP-1 function and regulation". Current Opinion in Cell Biology. 9 (2): 240–246. doi:10.1016/S0955-0674(97)80068-3. ↑ Yamashita, Junro; McCauley, Laurie K. (2006). "The Activating Protein-1 Transcriptional Complex: Essential and Multifaceted Roles in Bone". Clinical Reviews in Bone and Mineral Metabolism. 4 (2): 107–122. doi:10.1385/BMM:4:2:107. ↑ Shaulian, Eitan; Karin, Michael (1 May 2002). "AP-1 as a regulator of cell life and death". Nature Cell Biology. 4 (5): E131–E136. doi:10.1038/ncb0502-e131. ↑ Bossy-Wetzel, E. (1 April 1997). "Induction of apoptosis by the transcription factor c-Jun". The EMBO Journal. 16 (7): 1695–1709. doi:10.1093/emboj/16.7.1695. ↑ Vesely, Paul Willi; Staber, Philipp Bernhard; Hoefler, Gerald; Kenner, Lukas (July 2009). "Translational regulation mechanisms of AP-1 proteins". Mutation Research/Reviews in Mutation Research. 682 (1): 7–12. doi:10.1016/j.mrrev.2009.01.001. ↑ Angel, Peter; Szabowski, Axel; Schorpp-Kistner, Marina (30 April 2001). "Function and regulation of AP-1 subunits in skin physiology and pathology". Oncogene. 20 (19): 2413–2423. doi:10.1038/sj.onc.1204380. ↑ Shen, Q.; Uray, I. P.; Li, Y.; Krisko, T. I.; Strecker, T. E.; Kim, H.-T.; Brown, P. H. (2007-07-16). "The AP-1 transcription factor regulates breast cancer cell growth via cyclins and E2F factors". Oncogene. 27 (3): 366–377. doi:10.1038/sj.onc.1210643. ISSN 0950-9232. ↑ Proffitt J, Crabtree G, Grove M, Daubersies P, Bailleul B, Wright E, Plumb M (January 1995). "An ATF/CREB-binding site is essential for cell-specific and inducible transcription of the murine MIP-1 beta cytokine gene". Gene. 152 (2): 173–9. doi:10.1016/0378-1119(94)00701-S. PMID 7835696. ↑ Rainio EM, Sandholm J, Koskinen PJ (February 2002). "Cutting edge: Transcriptional activity of NFATc1 is enhanced by the Pim-1 kinase". J. Immunol. 168 (4): 1524–7. doi:10.4049/jimmunol.168.4.1524. PMID 11823475. ↑ Sanyal S, Sandstrom DJ, Hoeffer CA, Ramaswami M (April 2002). "AP-1 functions upstream of CREB to control synaptic plasticity in Drosophila". Nature. 416 (6883): 870–4. doi:10.1038/416870a. PMID 11976688. ↑ Hirayama J, Cardone L, Doi M, Sassone-Corsi P (July 2005). "Common pathways in circadian and cell cycle clocks: light-dependent activation of Fos/AP-1 in zebrafish controls CRY-1a and WEE-1". Proc. Natl. Acad. Sci. U.S.A. 102 (29): 10194–9. doi:10.1073/pnas.0502610102. PMC 1177375 . PMID 16000406. ↑ Wai PY, Mi Z, Gao C, Guo H, Marroquin C, Kuo PC (July 2006). "Ets-1 and runx2 regulate transcription of a metastatic gene, osteopontin, in murine colorectal cancer cells". J. Biol. Chem. 281 (28): 18973–82. doi:10.1074/jbc.M511962200. PMID 16670084. ↑ Collins-Hicok J, Lin L, Spiro C, Laybourn PJ, Tschumper R, Rapacz B, McMurray CT (May 1994). "Induction of the rat prodynorphin gene through Gs-coupled receptors may involve phosphorylation-dependent derepression and activation". Mol. Cell. Biol. 14 (5): 2837–48. PMC 358652 . PMID 8164647. 1 2 Behren A, Simon C, Schwab RM, Loetzsch E, Brodbeck S, Huber E, Stubenrauch F, Zenner HP, Iftner T (December 2005). "Papillomavirus E2 protein induces expression of the matrix metalloproteinase-9 via the extracellular signal-regulated kinase/activator protein-1 signaling pathway". Cancer Res. 65 (24): 11613–21. doi:10.1158/0008-5472.CAN-05-2672. PMID 16357172. ↑ Hennigan RF, Stambrook PJ (August 2001). "Dominant negative c-jun inhibits activation of the cyclin D1 and cyclin E kinase complexes". Mol. Biol. Cell. 12 (8): 2352–63. doi:10.1091/mbc.12.8.2352. PMC 58599 . PMID 11514621. ↑ Knöchel S, Schuler-Metz A, Knöchel W (November 2000). "c-Jun (AP-1) activates BMP-4 transcription in Xenopus embryos". Mech. Dev. 98 (1-2): 29–36. doi:10.1016/S0925-4773(00)00448-2. PMID 11044605. 1 2 Kidd M, Hinoue T, Eick G, Lye KD, Mane SM, Wen Y, Modlin IM (December 2004). "Global expression analysis of ECL cells in Mastomys natalensis gastric mucosa identifies alterations in the AP-1 pathway induced by gastrin-mediated transformation". Physiol. Genomics. 20 (1): 131–42. doi:10.1152/physiolgenomics.00216.2003. PMID 15602048. ↑ Heim JM, Singh S, Fülle HJ, Gerzer R (January 1992). "Comparison of a cloned ANF-sensitive guanylate cyclase (GC-A) with particulate guanylate cyclase from adrenal cortex". Naunyn Schmiedebergs Arch. Pharmacol. 345 (1): 64–70. doi:10.1007/BF00175471. PMID 1347156. ↑ Kuo YR, Wu WS, Wang FS (April 2007). "Flashlamp pulsed-dye laser suppressed TGF-beta1 expression and proliferation in cultured keloid fibroblasts is mediated by MAPK pathway". Lasers Surg Med. 39 (4): 358–64. doi:10.1002/lsm.20489. PMID 17457842. ↑ Wu J, Bresnick EH (March 2007). "Glucocorticoid and growth factor synergism requirement for Notch4 chromatin domain activation". Mol. Cell. Biol. 27 (6): 2411–22. doi:10.1128/MCB.02152-06. PMC 1820485 . PMID 17220278. ↑ Martins G, Calame K (2008). "Regulation and functions of Blimp-1 in T and B lymphocytes". Annu. Rev. Immunol. 26: 133–69. doi:10.1146/annurev.immunol.26.021607.090241. PMID 18370921. ↑ Lunec J, Holloway K, Cooke M, Evans M (2003). "Redox-regulation of DNA repair". BioFactors. 17 (1-4): 315–24. doi:10.1002/biof.5520170131. PMID 12897453. ↑ Manicassamy S, Gupta S, Huang Z, Sun Z (June 2006). "Protein kinase C-theta-mediated signals enhance CD4+ T cell survival by up-regulating Bcl-xL". J. Immunol. 176 (11): 6709–16. doi:10.4049/jimmunol.176.11.6709. PMID 16709830. ↑ Wang N, Verna L, Hardy S, Forsayeth J, Zhu Y, Stemerman MB (September 1999). "Adenovirus-mediated overexpression of c-Jun and c-Fos induces intercellular adhesion molecule-1 and monocyte chemoattractant protein-1 in human endothelial cells". Arterioscler. Thromb. Vasc. Biol. 19 (9): 2078–84. doi:10.1161/01.ATV.19.9.2078. PMID 10479648. ↑ Fujita S, Ito T, Mizutani T, Minoguchi S, Yamamichi N, Sakurai K, Iba H (May 2008). "miR-21 Gene expression triggered by AP-1 is sustained through a double-negative feedback mechanism". J. Mol. Biol. 378 (3): 492–504. doi:10.1016/j.jmb.2008.03.015. PMID 18384814. ↑ von Knethen A, Callsen D, Brüne B (February 1999). "NF-kappaB and AP-1 activation by nitric oxide attenuated apoptotic cell death in RAW 264.7 macrophages". Mol. Biol. Cell. 10 (2): 361–72. doi:10.1091/mbc.10.2.361. PMC 25174 . PMID 9950682. ↑ Phelan JP, Millson SH, Parker PJ, Piper PW, Cooke FT (October 2006). "Fab1p and AP-1 are required for trafficking of endogenously ubiquitylated cargoes to the vacuole lumen in S. cerevisiae". J. Cell. Sci. 119 (Pt 20): 4225–34. doi:10.1242/jcs.03188. PMID 17003107. ↑ Nolasco LH, Turner NA, Bernardo A, et al. (December 2005). "Hemolytic uremic syndrome-associated Shiga toxins promote endothelial-cell secretion and impair ADAMTS13 cleavage of unusually large von Willebrand factor multimers". Blood. 106 (13): 4199–209. doi:10.1182/blood-2005-05-2111. PMC 1895236 . PMID 16131569. ↑ Hommura F, Katabami M, Leaner VD, et al. (May 2004). "HMG-I/Y is a c-Jun/activator protein-1 target gene and is necessary for c-Jun-induced anchorage-independent growth in Rat1a cells". Mol. Cancer Res. 2 (5): 305–14. PMID 15192124. ↑ Chang CJ, Chao JC (April 2002). "Effect of human milk and epidermal growth factor on growth of human intestinal Caco-2 cells". J. Pediatr. Gastroenterol. Nutr. 34 (4): 394–401. doi:10.1097/00005176-200204000-00015. PMID 11930096. ↑ Weber JR, Skene JH (July 1998). "The activity of a highly promiscuous AP-1 element can be confined to neurons by a tissue-selective repressive element". J. Neurosci. 18 (14): 5264–74. PMID 9651209. ↑ Lee W, Mitchell P, Tjian R (June 1987). "Purified transcription factor AP-1 interacts with TPA-inducible enhancer elements". Cell. 49 (6): 741–52. doi:10.1016/0092-8674(87)90612-X. PMID 3034433. ↑ Cohen MP, Ziyadeh FN, Lautenslager GT, Cohen JA, Shearman CW (May 1999). "Glycated albumin stimulation of PKC-beta activity is linked to increased collagen IV in mesangial cells". Am. J. Physiol. 276 (5 Pt 2): F684–90. PMID 10330050. ↑ Stark CJ, Atreya CD (2005). "Molecular advances in the cell biology of SARS-CoV and current disease prevention strategies". Virol. J. 2: 35. doi:10.1186/1743-422X-2-35. PMC 1087510 . PMID 15833113. 1 2 3 Lane SJ, Adcock IM, Richards D, Hawrylowicz C, Barnes PJ, Lee TH (December 1998). "Corticosteroid-resistant bronchial asthma is associated with increased c-fos expression in monocytes and T lymphocytes". J. Clin. Invest. 102 (12): 2156–64. doi:10.1172/JCI2680. PMC 509170 . PMID 9854051. ↑ Steiner C, Peters WH, Gallagher EP, Magee P, Rowland I, Pool-Zobel BL (March 2007). "Genistein protects human mammary epithelial cells from benzo(a)pyrene-7,8-dihydrodiol-9,10-epoxide and 4-hydroxy-2-nonenal genotoxicity by modulating the glutathione/glutathione S-transferase system". Carcinogenesis. 28 (3): 738–48. doi:10.1093/carcin/bgl180. PMID 17065199. ↑ Ahn JD, Morishita R, Kaneda Y, et al. (June 2001). "Transcription factor decoy for activator protein-1 (AP-1) inhibits high glucose- and angiotensin II-induced type 1 plasminogen activator inhibitor (PAI-1) gene expression in cultured human vascular smooth muscle cells". Diabetologia. 44 (6): 713–20. doi:10.1007/s001250051680. PMID 11440364. ↑ Kang S, Fisher GJ, Voorhees JJ (November 2001). "Photoaging: pathogenesis, prevention, and treatment". Clin. Geriatr. Med. 17 (4): 643–59, v–vi. doi:10.1016/S0749-0690(05)70091-4. PMID 11535421. ↑ Navasa M, Gordon DA, Hariharan N, et al. (June 1998). "Regulation of microsomal triglyceride transfer protein mRNA expression by endotoxin and cytokines". J. Lipid Res. 39 (6): 1220–30. PMID 9643353. ↑ Inagi R, Miyata T, Nangaku M, et al. (November 2002). "Transcriptional regulation of a mesangium-predominant gene, megsin". J. Am. Soc. Nephrol. 13 (11): 2715–22. doi:10.1097/01.ASN.0000033507.32175.FA. PMID 12397041. ↑ Kim S, Yu SS, Lee IS, et al. (April 1999). "Human cytomegalovirus IE1 protein activates AP-1 through a cellular protein kinase(s)". J. Gen. Virol. 80 (4): 961–9. PMID 10211966. ↑ Masuda A, Yoshikai Y, Kume H, Matsuguchi T (November 2004). "The interaction between GATA proteins and activator protein-1 promotes the transcription of IL-13 in mast cells". J. Immunol. 173 (9): 5564–73. doi:10.4049/jimmunol.173.9.5564. PMID 15494506. ↑ Navas TA, Baldwin DT, Stewart TA (November 1999). "RIP2 is a Raf1-activated mitogen-activated protein kinase kinase". J. Biol. Chem. 274 (47): 33684–90. doi:10.1074/jbc.274.47.33684. PMID 10559258. ↑ Simantov R (August 1995). "Neurotransporters: regulation, involvement in neurotoxicity, and the usefulness of antisense nucleic acids". Biochem. Pharmacol. 50 (4): 435–42. doi:10.1016/0006-2952(95)00068-B. PMID 7646547. ↑ Yang HS, Jansen AP, Nair R, et al. (February 2001). "A novel transformation suppressor, Pdcd4, inhibits AP-1 transactivation but not NF-kappaB or ODC transactivation". Oncogene. 20 (6): 669–76. doi:10.1038/sj.onc.1204137. PMID 11314000. ↑ Xie J, Pan H, Yoo S, Gao SJ (December 2005). "Kaposi's sarcoma-associated herpesvirus induction of AP-1 and interleukin 6 during primary infection mediated by multiple mitogen-activated protein kinase pathways". J. Virol. 79 (24): 15027–37. doi:10.1128/JVI.79.24.15027-15037.2005. PMC 1316010 . PMID 16306573. ↑ Khan MA, Bouzari S, Ma C, et al. (April 2008). "Flagellin-dependent and -independent inflammatory responses following infection by enteropathogenic Escherichia coli and Citrobacter rodentium". Infect. Immun. 76 (4): 1410–22. doi:10.1128/IAI.01141-07. PMC 2292885 . PMID 18227166. ↑ Kida Y, Inoue H, Shimizu T, Kuwano K (January 2007). "Serratia marcescens serralysin induces inflammatory responses through protease-activated receptor 2". Infect. Immun. 75 (1): 164–74. doi:10.1128/IAI.01239-06. PMC 1828393 . PMID 17043106. ↑ Gutzman JH, Rugowski DE, Schroeder MD, Watters JJ, Schuler LA (December 2004). "Multiple kinase cascades mediate prolactin signals to activating protein-1 in breast cancer cells". Mol. Endocrinol. 18 (12): 3064–75. doi:10.1210/me.2004-0187. PMC 1634796 . PMID 15319452. ↑ Brinkmann MM, Glenn M, Rainbow L, Kieser A, Henke-Gendo C, Schulz TF (September 2003). "Activation of mitogen-activated protein kinase and NF-kappaB pathways by a Kaposi's sarcoma-associated herpesvirus K15 membrane protein". J. Virol. 77 (17): 9346–58. doi:10.1128/JVI.77.17.9346-9358.2003. PMC 187392 . PMID 12915550. ↑ Greenstein S, Ghias K, Krett NL, Rosen ST (June 2002). "Mechanisms of glucocorticoid-mediated apoptosis in hematological malignancies". Clin. Cancer Res. 8 (6): 1681–94. PMID 12060604. ↑ Yokoo T, Kitamura M (May 1996). "Antioxidant PDTC induces stromelysin expression in mesangial cells via a tyrosine kinase-AP-1 pathway". Am. J. Physiol. 270 (5 Pt 2): F806–11. PMID 8928842. ↑ Chang CF, Cho S, Wang J (Apr 2014). "(-)-Epicatechin protects hemorrhagic brain via synergistic Nrf2 pathways". Ann Clin Transl Neurol. 1 (4): 258–271. doi:10.1002/acn3.54. PMC 3984761 . PMID 24741667. ↑ Gibbings DJ, Ghetu AF, Dery R, Befus AD (February 2008). "Macrophage migration inhibitory factor has a MHC class I-like motif and function". Scand. J. Immunol. 67 (2): 121–32. doi:10.1111/j.1365-3083.2007.02046.x. PMID 18201367.